Everyone likes a good analysis of a Mini-ITX sized board, but this time we're looking at a B360 chipset version. This chipset offers users the ability to jump into Coffee-Lake based CPUs who do not plan on overclocking. The ASRock B360M-ITX/ac we have on the test bench is a fully featured board with a single M.2 slot, Intel Networking (LAN and Wi-Fi), along with USB 3.1 (10 Gbps) ports. Over the past few weeks, we have looked at several small form factor (SFF) motherboards of all types. Recently we published our ASRock Z370 Gaming-ITX/ac review, which is a board with an eye towards gaming, but here the ASRock B360M-ITX/ac doesn't really place itself into any category. The board is intended to exist as a SFF option based on a mid-range chipset in Intel's B360. With overclocking not a possibility (among other things), users are able to save a few dollars as board partners tend to use only what is required for power delivery. Users are also to save money getting into the platform by choosing non "K" series CPUs and memory running DDR4-2666 or less. That doesn't mean it is without features. The B360M-ITX/ac includes Wi-Fi capabilities, USB 3.1 (10 Gbps) Type-A ports, as well as a M.2 slot. Those who are looking for RGB LED support will also have to look elsewhere as the board does not have any integrated, nor headers on the board supporting it. Users will have to bring the bling from elsewhere. Overall performance on this motherboard was fine, with it competitive with the other boards we have compiled data on. Single threaded performance and multi-threaded performance without AVX instructions landed just as expected, on par with other datasets and went without issue. This board did have the fast time to POST out of any board we have tested. We did, however, run across a couple of bumps in the road when testing POV-Ray and Blender. In those heavily multi-threaded AVX enabled benchmarks, the board hit power limits during these tests and throttled the CPU back and yielded lower scores. Once the power limit was raised, scores came back up in both tests, but not quite matching the other boards. This time, instead of hitting the power limits (raised to their maximum of 130W/140W Long/Short duration power limits) it ran into a "VR Temperature limit" issue according to Intel XTU and also throttled. This throttling didn't rear its head over a long period of time as temperatures increased, but showed up within several seconds of beginning the tests. The heatsink attached to the power bits, while small, made good contact and wasn't really warm to the touch. Even after placing a fan blowing directly over the VRM's it did not help. It just feels like out of the gate, these loads were simply too much for the board to handle. That said, all other loads tested, including gaming, were fine and didn't show any throttling behavior. But if the planned use for this board is to use it with an i7-8700K and heavily multi-thread AVX based workloads, other choices may perform better. In the B360 Mini-ITX realm, there are several to choose from, with at least one from each of the major board partners vying for your money. The ASRock B360M-ITX/ac is priced at around $100 when not on sale (currently $0 at Newegg) which is the same price as the GIGABYTE B360N WIFI ($99), and the MSI B360I Gaming Pro AC ($98). The most expensive option out of the four comes from ASUS and their ROG Strix B360-I Gaming ($128). Each board will have its own merits with the MSI and ASUS offerings giving users two M.2 slots versus one on the ASRock board and GIGABYTE. The ASUS board does have superior audio capabilities with its SupremeFX S1220A codecs (based off the latest Realtek ALC1220 codecs) as well as ASUS and GIGABYTE's Superior Wi-Fi using its Intel-based device supporting speeds up to 1.73 Gbps. There are other differences as well including RGB LED support as well as video output differences among others. ASRock has brought forth around a half-dozen motherboards in the B360 lineup. The lineup includes two Mini-ITX boards, three MicroATX boards and two ATX size boards giving users a complete lineup of form factors in the B360 lineup. B360M Performance mITX ? ? One important piece of information to note: technically these processors use the LGA1151 socket, also used by 6th and 7th Generation processors using the Z170 and Z270 chipsets. 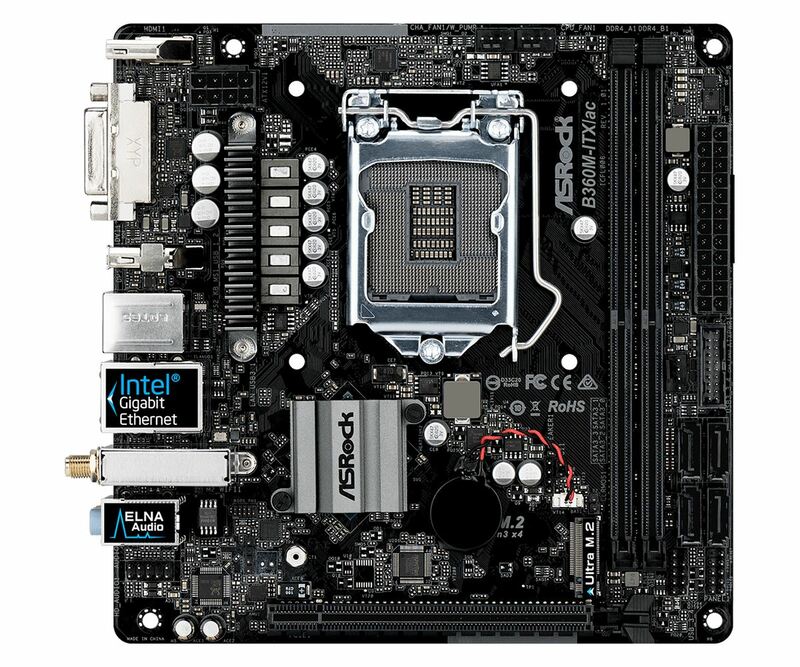 But due to several (albeit minor) difference in the pin-layout of these two sets of processors, the 8th Generation Coffee Lake will only work in Z370 boards and are not cross-compatible. 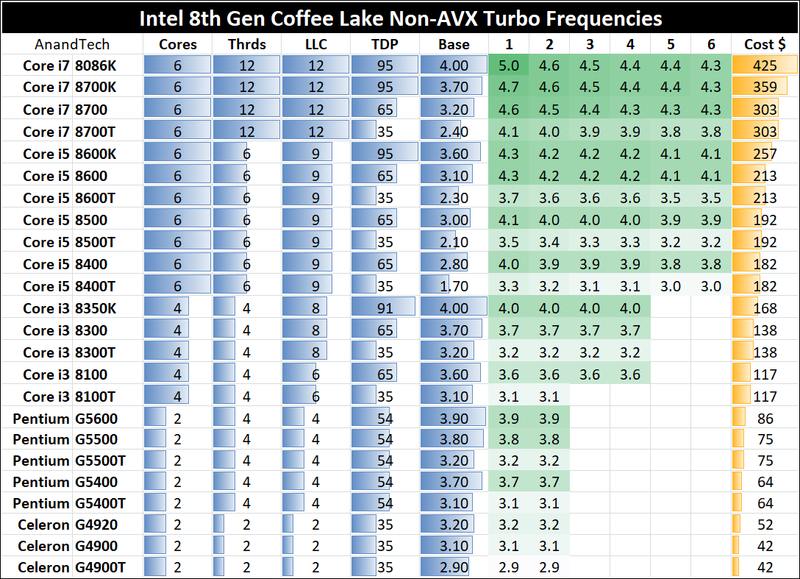 Back in October 2017, Ian Cutress reviewed a couple of processors (i7-8700K and i5-8400) in the Coffee Lake lineup – details on the rest of the product stack are listed below.